Located in central Honshū, Kyoto Prefecture (京都府 Kyōto-fu) is bounded by Fukui, Shiga and Mie prefectures on the east, Nara Prefecture on the south, and Hyōgo and Ōsaka prefectures on the west. It faces the Sea of Japan to the north. The prefecture is divided roughly into two parts, north and south, by the Tamba Mountains (丹波高地). The southern part, formerly called Yamashiro Province (山城国 Yamashiro no Kuni), is centred on the Kyōto Basin, and the northern part, formerly called Tamba (丹波国 Tamba no kuni) and Tango (丹後国 Tango no Kuni) provinces, is composed of the Tango Mountains (丹後山地). The southern part flourished after the capital was moved in 794 to Heiankyō (平安京), as Kyōto was then known. The southern part of the prefecture, of which the centre is Kyōto, is part of the Tōkaidō Megalopolis (東海道メガロポリス), the urban heartland of Japan, consisting of the urban centres of Tōkyō, Nagoya and Ōsaka, and has been undergoing continuous urbanization. The centre of the northern part is Maizuru on the Sea of Japan. Kyōto Basin, located in the southern part of the prefecture, is a graben basin. The mountains surrounding the basin are horst mountains and generally low. Mount Hiei (比叡山 Hieizan) located northeast of Kyōto, is only 848 meters high. The mountains of Tamba and Tango in the northern part of the prefecture are also not high; part of the Tango Mountains forms the Tango Peninsula and juts out into the Sea of Japan. Wakasa Bay (若狭湾) to the east forms a heavily indented coast with some good natural harbours. The principal rivers are the Ujigawa, the Katsuragawa, and the Kamogawa, all in the southern part of the prefecture and all of which flow into the Yodogawa. The only significant river in the northern part is the Yuragawa. The temperature tends to run to extremes in the Kyōto Basin. The coastal regions on the Sea of Japan are warmer in winter because of the Tsushima Current. Precipitation is heavier in the north. Remains from the Jōmon (10,000-300 BCE) and Yayoi (300 BCE-300 CE) periods have been discovered in the prefecture. After the third century, the Kyōto Basin was settled by the Hata clan (秦氏) and other naturalised immigrants (帰化人 kikajin, naturalised citizen) from Korea and China. Under the ancient provincial system (国軍 kokugun), Kyōto Prefecture was known as Yamashiro (山城国), Tamba (丹波国), and Tango (丹後国) provinces. 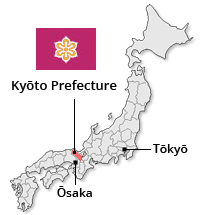 The prefectural system was introduced in 1871, and the boundaries of the prefecture were fixed in 1876. Commerce, traditional industries, and tourism are the main industries. Representative products include nishijin-ori (西陣織, brocade), yūzen silks, Kiyomizu ware (ceramics), lacquer wares, fans, dolls, and other craft. The manufacture of these traditional wares is concentrated in the city of Kyōto. The northern part of the prefecture is renowned for its Tango chirimen silk and Fushimi sake. Modern industries include machinery, metal, and synthetic fibre industries. The southern part of the prefecture, an extension of the Hanshin Industrial Zone (阪神工業地帯 Hanshin Kōgyō Chitai), has highly developed industries. Farming is centred on rice cultivation, but vegetables are produced in the suburban districts surrounding the Kyōto Basin, centring on the city of Uji. Cryptomeria and cypress grow from north of the city of Kyōto to the southern part of the Tamba Mountains. Fish, such as yellowtail, mackerel, and sardine are caught off the coast of the Sea of Japan. As the capital region for over a thousand years, Kyōto Prefecture an uncountable number of historical sites. Each year more than 30 million people visit the city of Kyōto, whose numerous attractions are listed on the Kyōto city page. Places on the outskirts of Kyōto, such as Ōhara, Kurama, Sagano, and Takao are also well known. On the Sea of Japan coastline are Amanohashidate (天橋立), a sandbar is located in Miyazu Bay and one of Japan’s three scenic views, and other scenic spots that belong to Wakasa Bay Quasi-National Park (若狭湾国定公園 Wakasa Wan Kokutei Kōen) and Sanin Coast National Park (山陰海岸国立公園 San’in Kaigan Kokuritsu Kōen). My nephew and I had great service at the information centre at the Kyoto train station when we spoke with Yamamoto. She was knowledgeable, articulate and very helpful. She should be commended for her excellent service.